LONDON: Evin Lewis‘ quickfire fifty and economical bowling from spinner Samuel Badree saw the West Indies to an emphatic 72-run victory over the World XI in the Hurricane Relief Twenty20 Challenge at Lord’s on Thursday. Lewis struck 58 off 26 balls, including five sixes and as many fours in a West Indies’ total of 199 for four with Marlon Samuels contributing 43 and Denesh Ramdin 44 not out. Badree then took two wickets in his first two overs for the reigning World Twenty20 champions before finishing with figures of two for four as the West Indies proved too strong for a World XI. Sri Lanka’s Thisara Perera made a fine half century, his 61 coming off 37 balls but the World XI never had any chance of winning this match after slumping to eight for four. But he was the only World XI player to score more than 12. 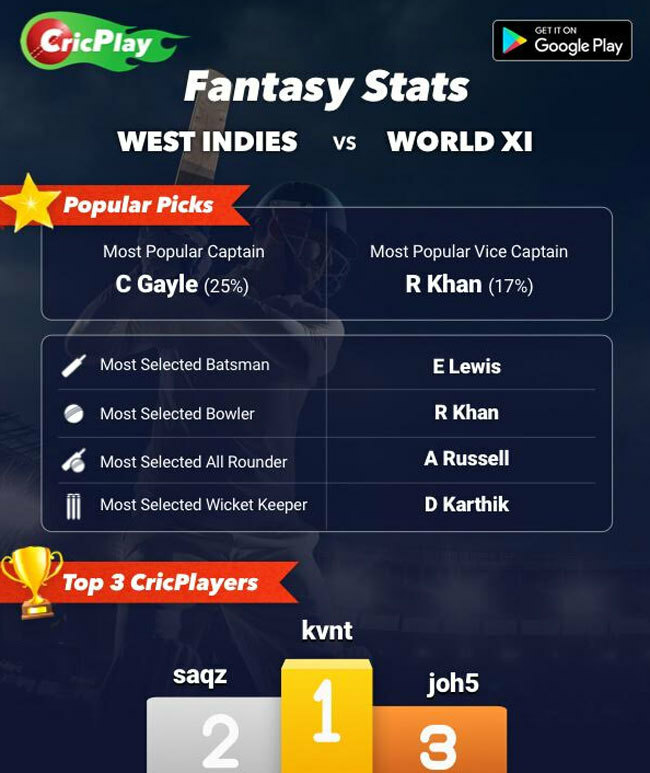 And, with Tymal Mills unable to bat, the World XI were all out nine wickets down when Mitchell McClenaghan was dismissed with the team on a total of 127. Kesrick Williams took three for 42 and Andre Russell two for 24 in a charity match to raise funds to rebuild cricket grounds in Anguilla and Dominica damaged by hurricanes Irma and Maria that swept through the Caribbean in September 2017. World XI captain Shahid Afridi donated $20,000 to Hurricane relief from his foundation, while all the players donated their match fees to the charity. Afridi, who retired from mainstream international cricket two years ago, received a guard of honour at Lord’s. “That’s something I’ll never forget,” said the big-hitting former Pakistan all-rounder. “For that to happen at the home of cricket, it’s massive. “The cause was everything tonight, and to have been able to help, it’s fantastic. “Thanks to everyone who came out and supported this,” he added. West Indies captain Carlos Brathwaite said: “For those affected by the hurricanes, there have been people left homeless, and have had their lives devastated. “So it’s important for those of us who can to be able to use our profile for the greater good,” he added.